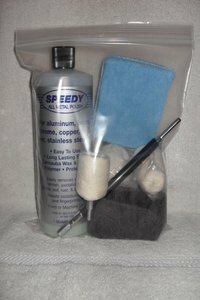 THE SPEEDY POLISHING KIT IS BACK! WE WERE WAITING ON THE 8″ EXTENDERS TO ARRIVE BACK IN STOCK. THIS KIT INCLUDES THE FOLLOWING ITEMS: ONE 32 OZ. BTL. 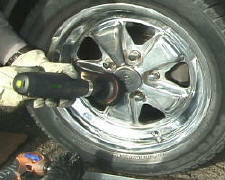 OF SPEEDY ALL METAL POLISH, FOUR 0000 STEEL WOOL PADS, ONE MICROFIBER APPLICATOR PAD, ONE 3″ MUSHROOM BUFF, ONE MEDIUM TAPER BUFF, ONE SMALL CYLINDER BUFF, AND ONE 8″ EXTENDER.